Push the Forgiving One Page at a Time button/photo to the left of this post and you’ll find the option to buy a signed copy of a modified version of When to Forgive. Including less detail, and fewer case stories, it provides a way for you to work very directly with your own forgiveness issues. Amazon..com advertises an e-book version which has one review – mine, which tells you not to buy the e-book. Why? Because it defeats the purpose, and the publisher did it in spite of my objection. That’s because the book is designed to be your own workbook/journal. After a general introduction, it includes written material on the left hand page, and guides on the right hand page for you to enter your own reactions/situation. Like When to Forgive it’s purpose is to help you make your own decisions about whether to forgive and how. Like the larger book, it helps you take into account the reaction you can expect as a result of what you decide and do. If it’s all the same to you, however, I’d appreciate your buying directly from me. I’m including a photo below of the comments on the back cover. One never knows what reactions will result when someone explores his or her own distress over a perceived injustice. A brilliant guru at Joyful Computing has figured out how to place “buttons” by means of which one can order my books from my blog. Actually, it’s not a button that one clicks on, but a photo of the book included to the left of the post (not the photo in the header). Starting with today’s entry, I’d like to highlight each of my available books, one post at a time. 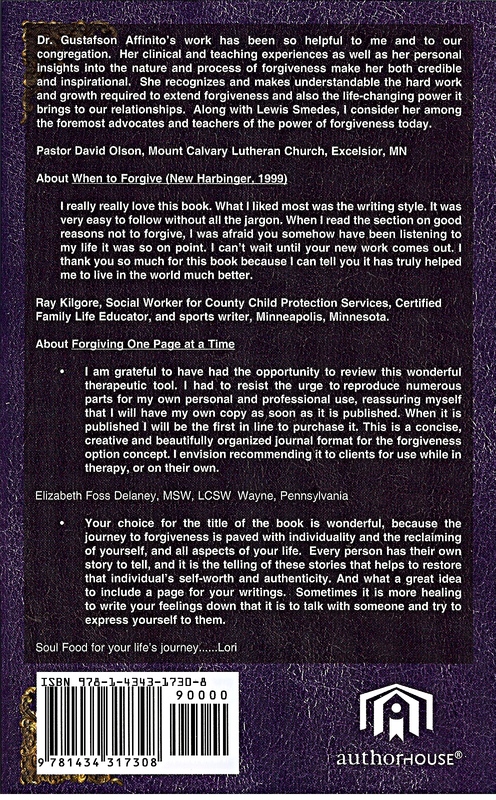 Happily when I retired from SCSU I was in a position to work on another area of professional interest – the Psychology of Forgiveness. The result of that focus was “When to Forgive,” today’s topic. As for comments at the time of publication, I’m posting a link to the amazon.com back page. You’ll find reader reviews there too. I believe what sets “When to Forgive” apart from other forgiveness books is just what the comment above implies. It isn’t a “You must forgive” argument. It is, rather, a guide to making the reader’s own decision about whether to forgive, and how. It is also unique in providing a definition of forgiveness. It might not be the definition on which everyone would agree, but for one who works through this book it provides clarity of meaning and goal. In the process of writing it I sought out, and sometimes just happened to discover, stories of forgiveness of all kinds of offenses. Many of them are provided as examples. I hope this helps you decide whether you want to click on the “When to Forgive” photo to order a copy. This would also be a great opportunity to comment on your own experiences with forgiving — or deciding not to. Last evening I finally got my DVD working and watched a program on Forgiveness. Unfortunately I was alone at home, so there was no one with whom to share my distress. So now you are it. So, here are some things that distressed me. One person thought that forgiving meant not getting angry. WRONG. Anger is the first step – well, maybe the second – in a long tough process of deciding whether to forgive, and if so, how. Another person thought forgiving meant saying what the other person did was all right. WRONG. If you think the other person did nothing wrong, then there’s nothing to forgive. No, forgiveness happens, if you choose it, because the offender did something wrong. Some seemed to think that forgiving means the lawbreaker will pay no price for the crime. WRONG. You are not the legal system, though these days you certainly do have an opportunity to influence it. You can forgive, relieving yourself of the negative effects of un-utilized anger, without preventing appropriate legal penalties. And that brings me back to anger. What a gift! What a motivator! The issue is not to avoid or deny anger, but to harness it. Some thought they couldn’t forgive unless the offender requested it and showed sufficient remorse. That may be the truth for some people, but it has its negative effects. Mainly the loss of power. As long as you are waiting for the person who hurt you in the first place to take action, you are powerless, stuck with your anger and pain. One more thing I noticed. A couple of people said murder was unforgiveable because the person who was hurt is dead and therefore can’t act. But the truth is, the murder of one person has a wide-ranging effect on loved ones, fellow workers, the larger community. The killer has hurt each of those people. Each one has the right to forgive – or not. There’s more, but I’ll stop here. My point is that the decision whether to forgive – and how – is a long, complicated personal process. And yes, I did say “whether” to forgive. That’s the point. And as I see people wrestling with these problems, I can’t help wanting to make sure they are aware of my two books on forgiving. The point in both of them is to help readers make their own decisions. No speeches, just guidance through the options and considering the outcome of one’s choices. By the way, if you decide to buy “Forgiving One Page at a Time,” don’t choose the kindle edition. I tried to stop the publisher from turning it into a kindle book. It won’t work, because it really is fashioned as a diary with some points and questions on the left hand page and a place for your own entries on the right. One last thing. If you have an opinion about either of the books, please do share it in the comment section. The problem is, as Ariely points out, the urge to vengeance is a powerful built in response to perceived offense. For those who would encourage forgiveness – as I do – it’s a problem requiring solution. Part of the solution lies in the other point he makes, that the vengeful emotion fades a bit with time. That’s why we count to ten, I guess. But there are other things we can do, as some of my clients have done. We can, for example, engage in wonderful fantasies of clever methods of torturing the offender. Carrying out the fantasies would probably not be a good idea, much as they would backfire on oneself – guilt, for example, an awareness that one’s own morality has been breached. Or the very fact that someone who has been punished rarely smiles with a “Thanks I needed that.” Nope, vengeance breeds vengeance. But maybe we need to add something. Vengeance doesn’t necessarily mean physical violence. In fact, Ariely goes on to give examples of what might be called positive effects of vengeance. One quick example (page 154). Cornelius Vanderbilt, whose successful steamship company was basically stolen from him by a couple of associates, responded as follows: “Gentlemen, you have undertaken to cheat me. I won’t sue you, for the law is too slow. I’ll ruin you.” Then he formed a new company so successful that eventually he regained control of his first company. OK. I’m sure the punished associates didn’t perceive that as positive. For them it was emotional and financial violence. But it did work for Vanderbilt. I’ll leave it at that. Food for thought. Knowing the hazards of vengeance, how do we handle it when it comes so naturally? It’s complicated. And now I’ll shamelessly refer to my two forgiveness books, both of which recognize that forgiveness is a difficult but doable process: When to Forgive and Forgiving One Page at a Time. And if you come across some nice, tidy “forgiveness” saying, I’d be very happy if you’d share it in a comment. Or maybe even a personal story of dealing with vengeance? Today I’m adding the final bulleted suggestions on helping someone decide how to handle a forgiveness issue. All are from pages 4-5 of When to Forgive . Please remember, this is not about a command to forgive. Telling someone to forgive is dangerous. It might result in a quick recitation of “I forgive” without the hard work behind it and accomplishment of the real and important gains of a good forgiveness decision. Shame might be added to the pain of suffering an offense if the victim believes in the “ought to forgive” and can’t. That’s the hazard of sermons — religious or otherwise — that tell the sufferer he or she must forgive. Realistically there may be actions the sufferer must take before genuine forgiveness. Or, it’s even possible that the sufferer might be better off choosing not to forgive. “When to Forgive” is about making and carrying out a decision after careful thought and work. So, here goes,the final complete list of what you might do to help someone trying to deal with the pain of an offense as he or she considers the forgiveness option. Be a good listener. Telling his or her own story is absolutely crucial to a person’s recovery from the effects of an offense. Encourage giving details, but don’t press your own advice or suggestions. Ask questions that encourage going into depth, but be sensitive to the person’s own self-regulating system. Don’t push beyond what he or she is ready to report. There are situations of extreme trauma where the victim is better off not remembering what happened. When your friend is asked to ‘probe the wound,’ ask for as much detail as possible. In fact, you may know the situation well enough that you can remember some things your friend has forgotten. But let your friend be in control of how much he or she can tolerate. You can discuss and help clarify, but don’t impose your own view. You can also help your companion fend off the efforts of others to dictate their beliefs. Your friend making the journey may want you to provide some feedback. Sometimes you may observe things that he or she doesn’t readily see. Often it’s the positives that people have difficulty identifying in themselves. As the book progresses, you can serve by moving beyond being the effective listener to being a good discussant. Perhaps you’ll be invited to talk over some ideas presented in the problem-solving phase. Remember to take direction from your friend; let the sufferer tell you how active he or she wants you to be in offering ideas. As your friend moves closer to making a decision, the fact that you are familiar with the offense that has occurred, and the people involved, makes you a good potential resource for considering the practicality of any punishment options that may be considered. You may gain some insights about yourself in this process and want to get feedback on what you are learning. But remember the focus is on helping to heal the person who suffered the offense. Today I’m adding the second bullet to the guides for someone who’s trying to help a friend or acquaintance work through the issue of whether and how to forgive. Maybe to get oriented, you might want to read yesterday’s blog. Following are the first two suggestions for the helper from pages 4-5 of When to Forgive..
Over the next few days I’ll be adding more bullet points. In the meantime, I’d love some feedback. Examples of helping or being helped would be wonderful.